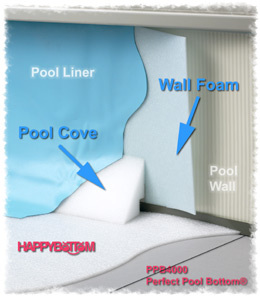 What is Waveless Wall Foam that’s used with an above ground swimming pool liner? Waveless Wall Foam for Above Ground Pool Liners is made by Gladon Pool Products and you can buy it at http://www.megapoolandspa.com for delivery to your home in a few days. When you install your new swimming pool liner, it’s a good idea to put the Wall Foam between your pool liner and pool wall. The wall foam is easy to install and you may want to get a can or two of the wall foam adhesive spray to help. Foam is 1×8″ x 48″ and sold in various lengths.